Historic Downtown Private, Hot tub; perfect ski retreat! Romantic, exquisite and only two blocks from Santa Fe Plaza (including Indian Market), 1/2 block from the Santa Fe Convention Center and one block north of the Georgia O'Keeffe Museum! 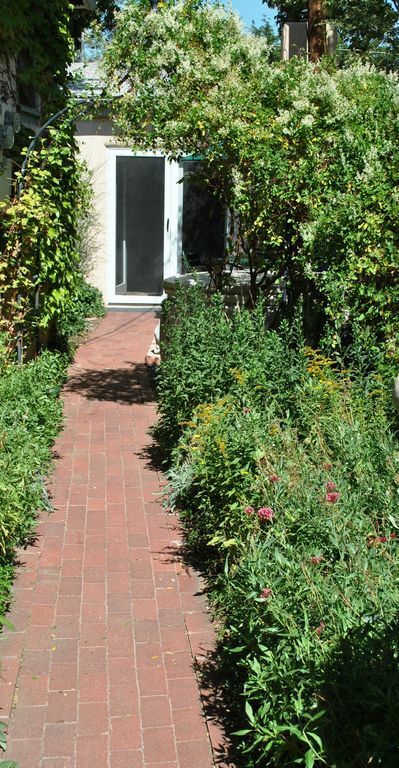 Tucked away in a charming historic downtown Santa Fe neighborhood is McKenzie House. Relax and enjoy Santa Fe at its finest. Just steps away from the Plaza and major attractions including Spanish Market, Indian Market and other world-class events, you can treat yourself in downtown Santa Fe. We are just 1/2 block from the Santa Fe convention center. The world famous Santa Fe Opera is easy access just 10 minute drive away. Ski Santa Fe is a short drive (or you can shuttle ) up the mountain (and great for Summer hiking!). This very special, newly remodeled and private guest house is located in the heart of the historic and quiet McKenzie Street neighborhood. We are the closest residential home north of the Plaza! Better than a hotel and more space than a b and b, you have your own fully equipped 'casita' (little house) and central location to enjoy the many sights and activities of Santa Fe and Northern New Mexico. Our comfortable and luxuriously relaxing cottage is freestanding and separate from our main home, both sanctioned historically significant structures by the City of Santa Fe. Our main home was built circa 1915, the casita was the original carriage house. McKenzie House is an intimate (approx. 350 sq. ft.) accomodation with every attention to detail. Experience the excitement and charm of Santa Fe in the comforts of your own private neighborhood. Dine at your leisure in your contemporary kitchen or the numerous world class restaurants within easy walking distance, relax by the kiva fireplace or in your private outdoor hot tub and patio, and stroll to the many sights and adventures of the Santa Fe Plaza. Take a short drive up the mountain to the Santa Fe ski area and magnificent hiking. Private parking (PLEASE NOTE: driveway/parking is suitable for passenger car (1). We cannot accommodate campers, trailers, moving vans or other over sized vehicles) , locking front gate and a beautiful southwestern garden are yours! So come, stay and relax. We have equipped our casita with all the amenities that will make your stay comfortable and like home: a romantic kiva fireplace, adjustable ceiling fan for a cool breeze, big fluffy towels for your hot tub and shower, and specialty soaps and shampoos to pamper you. Comfortable bathrobes and a hairdryer are furnished so you can leave yours at home. Queen bedding is the most comfortable Sealy Posturepedic on an Asian inspired Sachi platform. Our casita includes a 32' flat panel screen with DVD for movies (many provided), as well as high speed wireless internet access. We love Santa Fe and its rich culture, and you will be able to see this not only in the beautiful southwestern art and handicrafts with which we decorate our casita but also in your private garden and patio. Ideal for a single or couple (two is our maximum, sorry, no children or pets), this casita offers European comforts in a modern Santa Fe style. You are exactly one block north of the famed Georgia O'Keeffe Museum, one block west of the Community Convention Center and two blocks from the Santa Fe Plaza and the Lensic Theater Complex. Please note: This is a NO SMOKING property. Upon check-in your casita includes a bountiful breakfast basket with fresh ground coffee, an assortment of teas, fresh-baked muffins, fruit, museli/granola and fresh squeezed orange juice. A written detailed guide will await you providing activities and suggestions for your stay, including fine restaurants within easy walking distance, and activities in town and surrounding communities. Choose McKenzie House for your next Santa Fe visit and enjoy! Cynthia has lived in northern New Mexico for over 20 years and is a museum professional who specializes in traveling exhibitions. She is also active in the Santa Fe arts community, past Chair of the Santa Fe Arts Commission and Art in Public Places committee. In her 'spare time' she enjoys traveling and gleaning more ideas for McKenzie House.She also plays tennis and hikes whenever she can! When Cynthia was looking to purchase a home in Santa Fe, her main objective was to buy a residence in downtown Santa Fe, and with a guesthouse that could be converted to a vacation rental. The downtown area of the city is uniquely special and offers so many possibilitites for visitors. In the 20 years she has owned the property, she has remnodeled both the main house and the guesthouse with comfort and privacy in mind, and including a contemporary flair. McKenzie House is located smack-dab in the middle of the city, in the historic Staab Street neighborhood. The famed Georgia O'Keeffe Museum is one block to the south; the Convention Center 1/2 block to the east. Endless shopping, restaurants and cultural sites are literally outside the door, so visitors to McKenzie House can park the car in their private driveway and walk to all the events and asssets of the downtown area, including Indian Market.Attending the Santa Fe Opera? It is just 10 minutes away and just to our north. The casita itself is private and extremely comfortable, including an outside hottub with a private deck, so after those long, enjoyable days in our the city, guests can retreat to their own freestanding, private casita and relax. What could be better! We are two blocks from the Plaza! off street private drive. Passenger vehicles only- driveway will not accommodate campers, moving vans, or other over sized vehicles. includes all dishes, glasses, wine/champagne glassware, etc. Brand new Solana tub with back massage- Heavenly!And exclusive to the casita. Very comfortable and cozy casita. Fantastic host! Enjoyed the walks to Sante Fe historic district! Cozy and convenient. We could see the fireworks for New Year's Eve. Walking distance to all the best stuff. Hot tub and fireplace were amazing and bed was super comfy. Bumble Bee Baja cafe, Izma Sushi, and Il Vicino Wood Fire Pizza nearby were all delicious. Love it, will come back! We enjoyed our stay. Had all we needed and close to everything. The Kiva fireplace was great. Beautiful casita in Great location! We thoroughly enjoyed the casita and hot tub. We were welcomed with a fruit and breakfast basket and some refrigerated items upon our arrival. The casita is well stocked and Cindy was a great host! I would definitely book again! Cynthia made a remarkable effort to insure we arrived to a cozy welcome. A perfect spot in the perfect location to experience downtown Santa Fe. Every hospitality detail was addressed. I was so surprised to find the basics to get through the first day in an unfamiliar city. Such a delight to immediately settle in after a long trip. We felt like the Casita was our home for the week. Thank you. We offer a reduced weekly rate, depending on season: OFF: $800 LOW: $950 MAY/SEPT: $980 HIGH: $1100. plus $60 cleaning fee per rental (deducted from deposit). We offer DISCOUNTS with NO SECURITY DEPOSIT for our RETURN GUESTS!